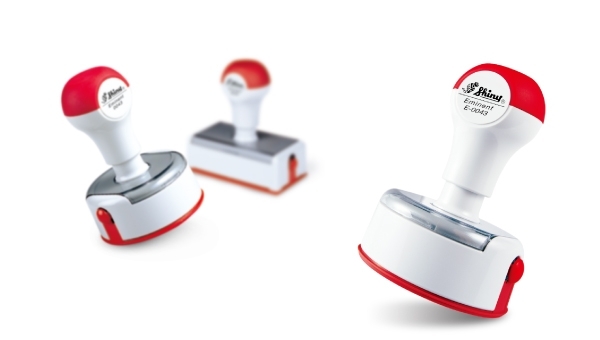 The easy positioning indicator enables the users to stamp in the desired location. Eminent Pre-inked Stamp can be re-inked for thousands more of waterproof impressions. In order to refill ink, set the stamp on the two supports. Fill the ink into the holes in the center. Gently insert the ink tubes into the holes in the center to fill the ink. Press the red side buttons to insert the stamp mount. Remove dummy cover from the stamp mount. Glue processed flash die to cartridge. Place the migration accelerator and close the bottom cover ( with the migration accelerator in position) to speed up the ink penetration. Remove the migration accelerator when the flashed die is inked.